The Fairtrade-accredited range sold globally is marked by bold varietal flavours. The one white and three reds are made from grapes sourced from Cape vineyards certified by FLO-CERT under the Fair Label Organisation (FLO) Standards that forms part of Fairtrade. Growers are paid a premium for their fruit that is directed towards social development of the wine-farm workers, who decide on how the funds are to be spent. 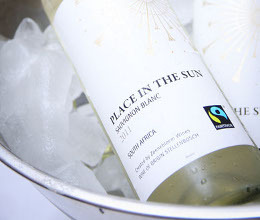 Deon Boshoff, head of the winemaking team behind Place in the Sun wines and himself the son of farm workers, describes the four wines as refreshing and approachable. "The Sauvignon Blanc is crisp and tangy with aromas of passion fruit and a piquant palate with hints of pineapple. The reds are soft-textured with supple tannins." He explains that the 2010 Shiraz is a full-bodied, fruity wine with notes of berry and spice, while the 2010 Cabernet Sauvignon is redolent of juicy red and black berries and the 2010 Merlot, he says, is "bursting with sun-ripened red berry and plum characters". The wines are available nationally. The Sauvignon blanc is expected to retail for around R35 and all the reds for around R45.